Sixteen-year-old Dee is a cloverhead - someone who can see faeries. When she finds herself irresistibly drawn to beautiful, mysterious Luke, Dee senses that he wants something more dangerous than a summer romance. But Dee doesn't realise that Luke is an assassin from the faerie world. I'm going to start this review by saying that I don't have the best track record when it comes to books about faeries so I wasn't sure if I should read Lament or not. Having said that I am also a massive fan of Maggie Stiefvater, I love her Wolves of Mercy Falls series and I also really enjoyed her recent stand alone book The Scorpio Races. If anyone could convince me I like faeries then I was pretty sure it would be Maggie! As I expected Lament is beautifully written, I don't think this author will ever write a book that isn't full of wonderful descriptions that transport you to the worlds she has created. I also enjoyed the mythology of her faeries more than I thought I would, these faeries are vicious, cunning and manipulative and staying one step ahead of them isn't going to be easy for our main character Dee. Unfortunately I didn't love the book as much as I've loved Maggie's later releases though. It's by no means a bad book but it didn't capture me the way her others have so although I will still read the sequel Ballad I won't be in a rush to do so. Dee is a talented musician but she suffers from terrible stage fright whenever she has to perform in front of an audience. I found it easy to relate to her nervousness and I loved how her friend James was so supportive of her. What I didn't like was the romance between her and the mysterious Luke. Even when she finds out that Luke is an assassin who has killed countless victims and that she is his latest target she brushes it under the carpet because she is attracted to him. I wanted her to find out more about why he had done the things he had done before she even considered dating him but that just didn't happen. I don't enjoy the kind of instant connection that was between them when there was nothing to back it up apart from suspicion and behaviour on his part that should have had her running a mile in the opposite direction. Once you start to find out more about why Luke is the way he is then I started to like him more and I think I'd have preferred the romance if it had developed more slowly. Although this wasn't my favourite book I still think Maggie Stiefvater is a wonderful author, she is on my automatically buy list and I'm very much looking forward to seeing what she comes up with in the future. 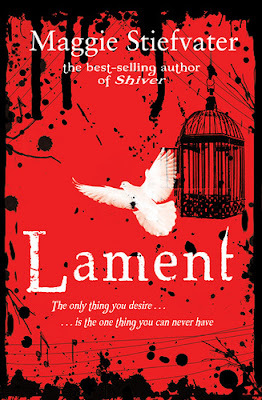 I would recommend her more recent books to anyone and if you're a big fan of faeries then I'm sure you will also enjoy Lament so don't let me put you off trying it. I'm with you on not always connecting well with fairies, but I loved this book. I think Maggie can write about anything and I'd be interested!